Coming to Ninh Thuan, to the land of wind and sun, not only you will admire the unspoiled beauty of famous beaches like Ninh Chu, Vinh Hy bay, Ca Na or the ancient and mystical tower Champa or the romantic sand hill of Nam Cuong, but also the notorious delicious list of cuisines: dried squid, shrimp cake, chicken rice, iguanas, goat, lamb and many more. 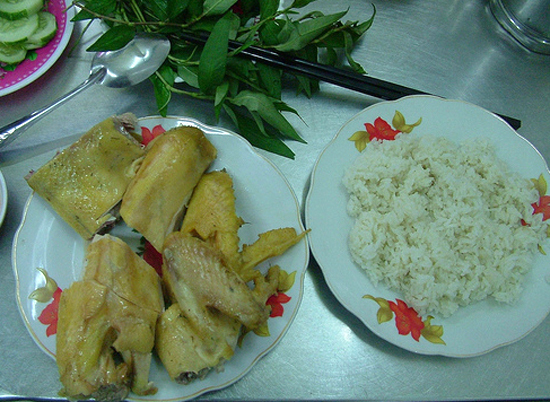 Everywhere in Vietnam, you can easily find a dish of chicken rice. From deep fried to grilled, chicken rice anywhere else is not even close to the steamed chicken and rice in Binh Dinh. The chicken is chopped into bite-size but not shredded and place on top of the rice. The land of Phan Rang is the land of sun and wind, and because of such extreme climate, the chicken is strong and their meat is tough and solid, yet sweet and flavorful. The chickens used to cook are which have laid eggs once. According to many experience chefs, the one-egg chicken will have softer meat than chickens which have had twice. There is one special sauce that makes the chicken rice unique: the fish sauce with smashed garlic and chili or fried salt and chili. One other essential is thing a dish of cilantro dish. When eating Phan Rang chicken, feel free to use your hand to shred the meat and dip it into the sauce. Eating chicken and rice at the same time will help you recognize the sweet of the chicken, the fat of the rice. Iguanas are a type of reptiles live in hot sand dunes, and extremely fast. They go out and find food early in the day, which are herbs, and they drink the night dew. Because of such diet, their meat is flavorful, sweet and strong, considered as a tonic. Their meat is white like chicken meat, yet sweeter, softer; their bones are soft, almost like tendons. From iguanas, there are seven dishes can be made of them: grilled, salad, porridge, chopped meat with rice paper, tamarind hot pot, roasted and steamed. Each will give you a different experience. The salad is the most difficult to make, and requires a special recipe in order to pull through. After being skinned and gutted, the iguanas are grilled until their meat turns yellow. After chopping the meat, and frying it with June plum and mango, herbs, peanut and especially the “Xoai dong” leaves, which grown abundantly on the cliffs of Ninh Thuan, which are bitter, that you can try the salad. 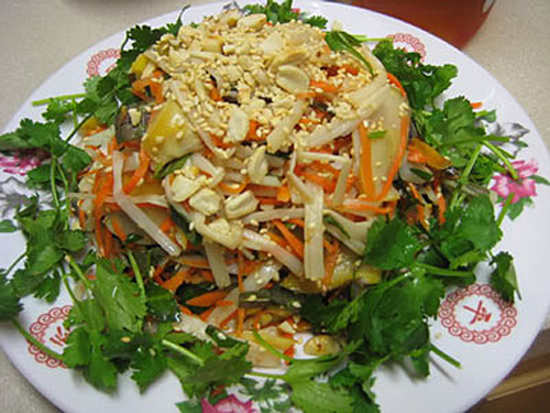 The salad is eaten with thick sesame rice paper. The best is the grilled iguanas. When grilling the iguanas, you can leave the skin on. The eggs are fat, and considered the best. The grill iguanas are dipped in green chili salt, and eaten with “xoai dong” leaves. The bones are crunchy that you can chew them as well. Eating the iguanas dishes, and you will experience a peculiar feeling to another. 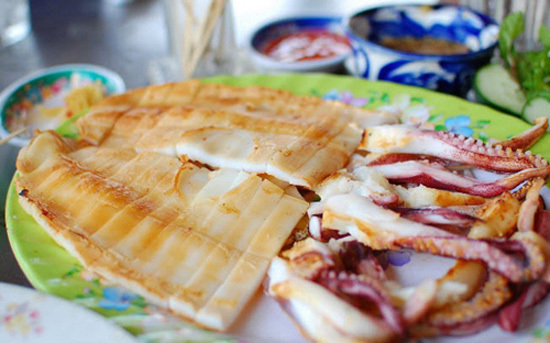 The one-sunny-day squid is delicious, soft and sweet thanks to the wind, the sun and the salt from the sea of Ninh Thuan. Different in the making process from other squids, the squids have to be fresh from the sea, and they are only dried under the sun once. The process requires skill and knowledge so the outside of the squid is dried and the inside is still fresh, and when grilled, the squid is still fresh, soft and white. There are many types of squids: leaves, tube, squid-topus (it is a squid, but looks like an octopus), pin and many more. Only the tube squid is fit for the job. When grilling the squid, you have to adjust the fire so the fire is not too big and also use new coal to grill the squids. The squid, from the color white, will turn to yellow, which looks very tasty too. With a perfect fire, the squid will be cooked both in and outside, but if the fire is old, the squid will be only cooked on the outside. You will not need any kind of sauce beside the hot chili sauce. When eating the squid, you will taste the sweet of the squid combines with the hot of the chili. The people in Ninh Thuan and other places also call this snail “the woman breast” snail because of its shape, like a breast of a woman. 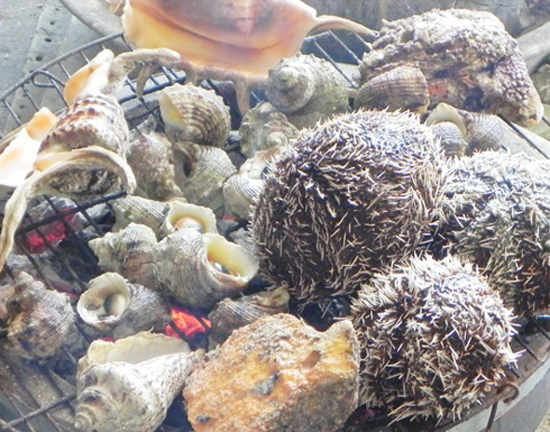 There are many ways to cook the snail, simplest are to boil or grill. A more complicated dish of the snail would be the salad. After washing the snails, you will also need to boil them. Using a pair of chopsticks to turn the snails so the snails can be completely cooked, you will also need to remove the waste of the snail, which has a green color. You will also want to mince the snail so that you can eat it easier. Ingredients to mix with the snail consist of bacon, sliced cucumber, cilantro, smashed peanut, fried onions. The snail also needs lemon juice mix with sugar and bit of fish sauce so the sauce can be sour and sweet. Pouring the sauce on top of the snail, bacon, cucumber and cilantro, mixing everything together and putting some peanut and fried onions on top and you will have a complete snail salad. The sauce to dip the salad is made of the best fish sauce of Ca Na, with a bit of garlic, lemon, and chili to increase the flavor. Here, you can also have some shrimp crackers and sesame to eat with the salad. You will want to prepare an empty belly before eating this, because you will want more. Visiting the city of Phan Rang—Cham Tower, you should definitely try the wonderful seafood of the region such as many type of crabs, squid, endless type of sea snails like oysters, scallops, fish and shrimp. Fresh seafood boiled or grilled with a bit of green onion and peanut, is the best. Remember not to add to much extra ingredients to keep the meal original. 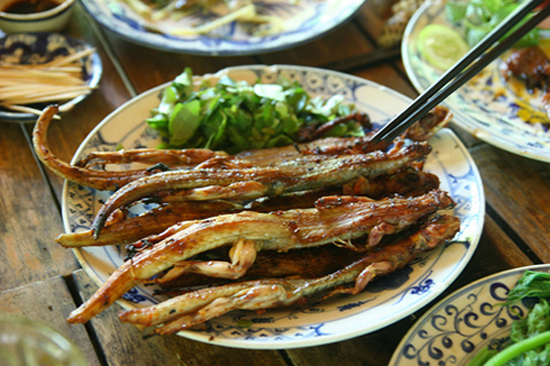 Beside from the seafood, Ninh Thuan is also famous for its herds of lamb and goat which produce lots of delicious dishes. The lambs and goats in Ninh Thuan are all naturally farmed, almost like mountain goat, so the meat is strong and delicious with a lot of meat and minimum of fat. The foods for these cattle are grapes, grapes leaves, apple leaves, spinach… All of the food is natural. There are many famous goat and lamb dishes in Ninh Thuan like grilled lamb, roasted lamb, or seven dishes of goat, goat hot pot. Lamb and goat is, not only delicious, but also good for your health. If cooked with herbs and medicine, the meat can be extremely for both men and women, for the elderly. 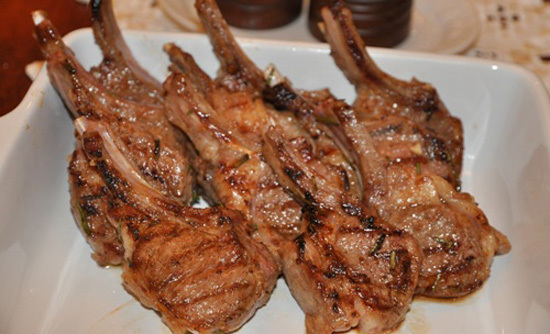 Dishes such as lamb stewed with herbs or papaya are some examples. At Posanu Tower, you can enjoy the traditional goat dish of the Cham people. After a wonderful musical show, you can enjoy the delicious dish of goat. What is better than that, right? Visiting Phan Rang, Ninh Thuan, you should definitely have to try the delightful grilled rice paper with oil green onions, a bucolic dish yet delicious and unique. The rice paper is made of the best rice flour combining with sesame, and is coated with the perfect thickness. Choosing the shrimp sauce, you will want the most delicious, and add in some other ingredients to increase the flavor. You also need some timber and charcoal to grill the rice paper, too. Remember to start the fire ahead so the rice paper can be grilled quicker and better. Whipping a bit of sauce while grilling the rice paper, adding a bit of chili and an egg, waiting for the egg to be baked and then you have a delicious yet simple meal. Cutting the cake into smaller pieces, you should add in some sauce and slowly enjoy the bold flavor of the sauce, the fat of the oil green onions, the crunchy of the rice paper and the salty of the egg. Cakes after cakes will be hungrily swallowed! 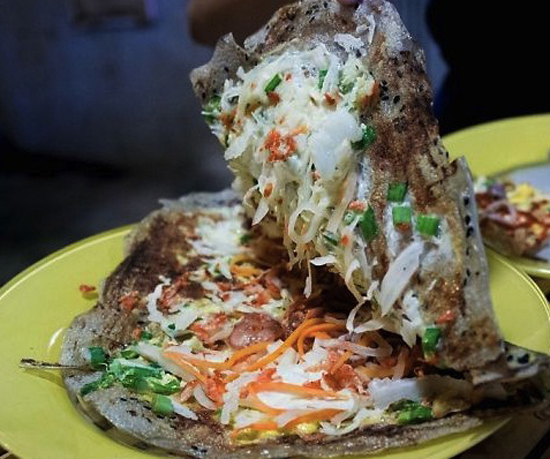 Ninh Thuan, along with so many cuisines, is also a great destination for Vietnamese pancakes lovers. 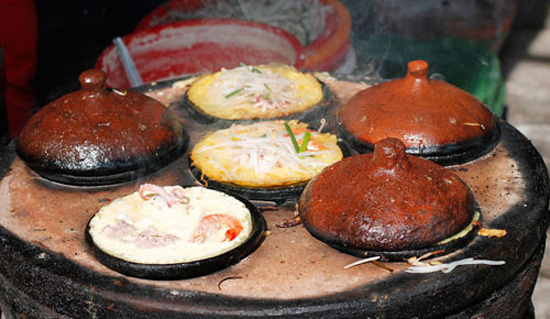 Different from many other places, the Ninh Thuan pancake is cooked in clay mold, and placed in a bigger oven, which can hold four to five molds. The cake doesn’t need a lot of oil to coat the mold, and just enough amount of flour to make the cake crunchy, not soft. When eating the cake, you should feel free to add in peanut, bean sprouts, and dip the cake in the amazing sauce. The pancakes are usually served with some sprouts, shrimps, or meat. The locals don’t use the cake to make a roll like the people in the South but drop the cake right in the sauce. 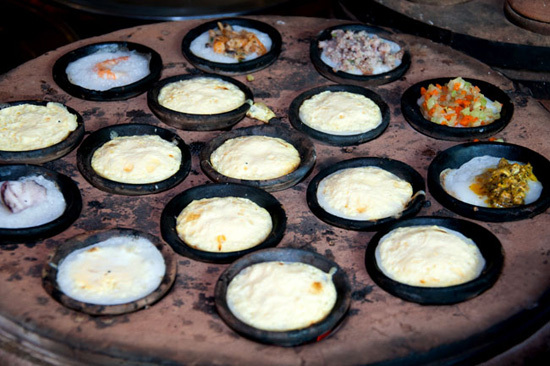 It is a huge loss for you if you came to Ninh Thuan and didn’t try the amazing shrimp cake. The sour, spicy and softness of the cake will make you remember it forever. The cake is made of rice flour mixed with some sticky rice flour, and baked on a very small, custom designed mold. The experience chef will know how to remove the cake from the mold intact, and the cake has to be soft and the crust is yellow, not burnt. Using the clay mold to bake, the cake doesn’t use a lot of oil. 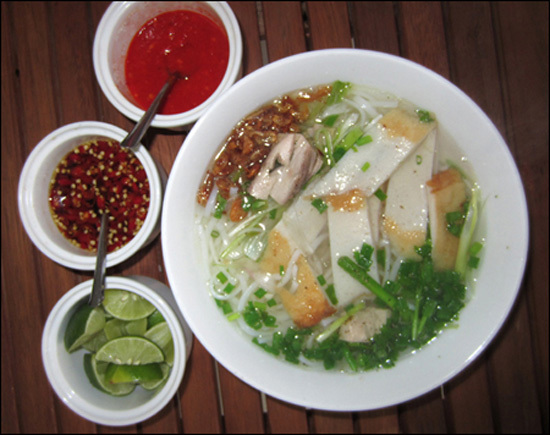 The sauce used to eat with the cake varies from peanut sauce, vinegar sauce, or fish broth. The vinegar sauce is made of vinegar, a bit of tamarind, pineapple, to make the sauce sour and reduce the salty. After removing the cake from the mold, dipping into the oil grass onion, you will be able to taste the sweet of the shrimp, the fat of the eggs, the crunchy crust, the spicy chili sauce, and the sour of raw mango that will make you hungry for more. Fish rolls soup cake is a combination of fish, shrimp, and the broth of the soup made of fish. The special feature is the soup cake made from the rice flour, which is only a little bit bigger than the normal noodle. The broth is sweet thanks to the fish bones, which is also the key characteristic of the meal. The soup cake is cooked with fish rolls. The fillet of the fish is used to make the rolls, and the rolls are either fried or boiled. The fire is small so the broth can be clear, less fat, just enough to heat up the soup cake and the fish rolls. The sweet of the yellow fish rolls, the fat of the white soup cake, the green of cilantro, the bold flavor of pepper are all combined to create a perfect cuisine. Eating it hot and slowly, feeling the flavors mixed together, you will definitely want a second for sure. Coming to Ninh Thuan, you will notice miles of grapevines spread through the region. 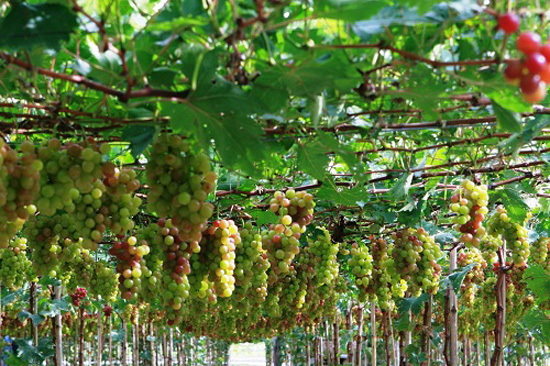 Because of the sun, the wind, the skillful hands of the weather and people of Ninh Thuan, the grapes here are sweet and juicy. Coming to see the grapevines and you will have nothing but admiration for this wonderland. Ninh Thuan grapes, if coated with some ice, are fresh, maybe a bit sour but mostly sweet will light up your appetite. Not only growing the grapes to use daily, the people here also use them to make wine. Grape wine is a unique cuisine of Ninh Thuan. Coming to Ninh Thuan, don’t forget to bring back some dried seafood, a little bit of sweet fresh grapes, a few bottles of wine, and a few jugs of fish sauce. All, with some love from Ninh Thuan, will make you remember for the longest time about this magical land.